The abbreviations used in the Bibliographic number field in the Full Record display in Early European Books refer to the following sources. STC A. W. Pollard and G. W. Redgrave, A Short-title catalogue of books printed in England, Scotland, & Ireland and of English books printed abroad: 1475–1640 (second edition, revised & enlarged by W. A. Jackson, F. S. Ferguson and Katharine F. Pantzer, (1976–1986). 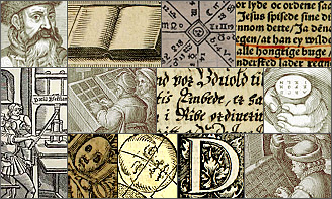 In Early European Books the Document features search allows users to find documents that contain examples of 18 different kinds of special features (listed below). Although the Document features indexing is applied to individual facsimile Document Images in Early European Books, users should note that illustrations and other graphic elements are not individually subject indexed. A search for Danmark* combined with Document features: map will retrieve documents containing maps with instances of Danmark in the Full Record, but it will not restrict the search to items that contain maps of Denmark. Chart: A page that displays information in a graphic or tabular form. Coat of arms: A symbolic emblem of heraldic bearings, usually consisting of a crest and motto. Form: A page with blank spaces to be filled in by hand, often pertaining to legal or church issues. Genealogical table: A graphic depiction of the line of descent of a family, often in the form of a family tree. Handwritten page/insert: A page or loose insert without printed text or printed illustrative matter featuring handwritten notes or commentary and/or other marks made by hand. Illuminated lettering: Lettering decorated with pictorial elements or illuminated with the application of colour, usually a decorated or illuminated initial marking a division in the text. Illustrated page borders: Decorative elements (frequently repeated) that enclose the main content of a given page. Illustration: Any graphic representation not specifically listed in other descriptions. Manuscript marginalia and other annotations: Marginal notes, annotation, commentary and other marks added to the printed source by hand. Map: A representation, normally to scale and on a flat medium, of a selection of material or abstract features on, or in relation to, the earth's surface or the surface of another celestial body. Musical notation: The score of a piece of music in whole or in part (i.e. staff, clef, notes etc). Plan: A drawing showing relative positions on a horizontal plane (e.g. relative positions of parts of a building, a landscape design, a graphic representation of a military manoeuvre). Plate: An image printed from an incised plate and inserted into the regular numbering and signatures of the book, sometimes in the form of a fold-out. Portrait: A picture of a person or group of persons. Printed marginalia: Printed marginal notes, annotation and commentary separated from the main body of running text. Printers' marks - Colophon: Decorative device or insignia identifying the printer found at the end of the work. Printers' marks – title page: Decorative device or insignia identifying the printer found on the title page. Rubricated text: Text printed in red, often on a title page or forming a section heading.